Relax on the balcony while watching the sun set. 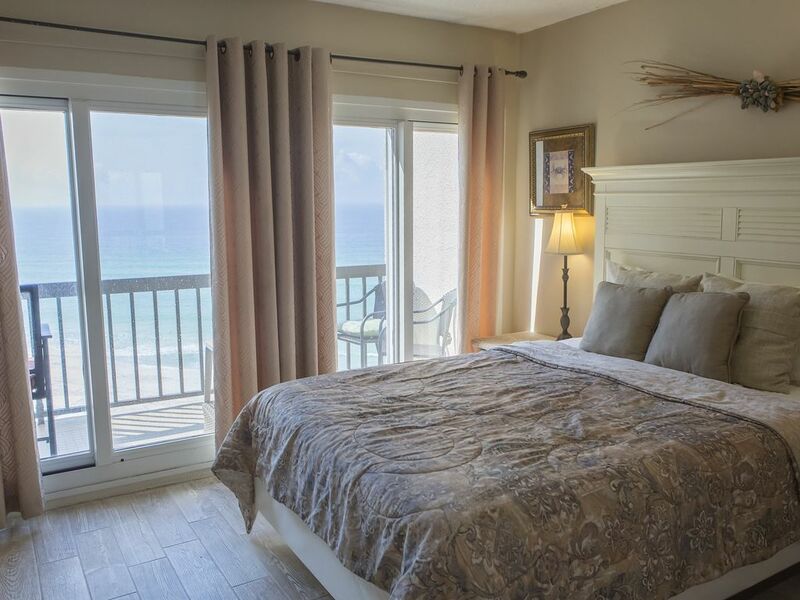 Master bedroom with balcony facing the beach. Condo # 928 has 2-bedrooms. Master with private bathroom, Guest bedroom with full bath and 1/2 bath down stairs. Full kitchen, washer and dryer and Internet service. Sleeps 6 with sleeper sofa. Resort amenities: (2) swimming pools (heated in winter), fish cleaning table, boat dock, fishing pier, sauna, exercise room, (4) lighted tennis courts, game room, basketball court, beach rentals, paddleboats, suffleboard, picnic, grilling area, and playground. Can't wait to come back!!! This condo was perfect for our family of 6!! The kitchen was fully stocked with everything you could need or want to cook with. The views from the balconies are breathtaking. We loved having a balcony in the master bedroom, we sat out there every night for hours. The condo was very clean and made you feel right at home. The area Pinnacle Port is in is amazing! Once you enter the gates you are surrounded by beautiful homes and quiet streets. Pinnacle Port is very quiet and we loved the indoor pool, it was great for the day we didn't want to get sandy and sunscreened up. I truly cannot say enough good things about this condo! We have never stayed anywhere we loved as much as this place! We can't wait to come back! We certainly do appreciate your vote of confidence regarding your stay at our condo Unit # 928. Thank you. We are so glad you had a wonderful experience with us. We look forward to your visit next year. Please see our web site when planning your 2017 vacation with us. Please call me if you have further questions. My family and I enjoyed our stay at Pinnacle Port very much. The area was new to us but we found shoppping and restaurants close by and convenient. We enjoyed walks on the beach and also walking over to the lake area. The photos were accurate. The place is beautiful. Grandkids enjoyed Shipwreck --a water park. We also visited the park next to the property--where we discovered the cute crabs. We will return. Clean & well maintained, will recommend to others. Jackie, GA.
Condo was excellent! Great location and friendly staff. Owners very easy to work with and had condo well supplied with toiletries, etc. We've stayed at other locations locally and this was by far our best stay. Will definitely return!